The SG-1 team`s mortal enemy, Apophis, is hunted by the Goa`uld and throws himself at O`Neill`s mercy. Tortured and close to death, Apophis proposes a deal, revealing all the knowledge of the Goa`uld in exchange for a new host body. But is it a deal with the devil? An alien traps Jackson with his body-swapping invention, steals Jackson`s body and escapes to Earth. As Jackson lays dying in the alien`s ageing, worn-out body, O`Neill and Teal`c accidentally switch bodies too and unless the alien is captured, no-one will ever be the same! On a routine reconnaissance mission, the SG-1 team discovers a civilisation of friendly aliens, but suddenly, the beings fall ill. A plague, somehow caused by the team, sweeps the planet and O`Neill and Jackson are infected as well. Can the SG-1 team save their friends and a whole civilisation? 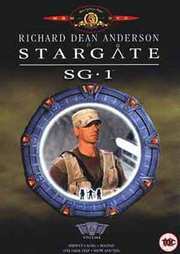 A young boy mysteriously appears at Stargate command and pleads for help, claiming that the Goa`uld are chasing him to find his race of invisible beings. But the SG-1 team is duped as the invisible aliens actually plan to destroy humanity 0 and the invasion has already begun!